Slender bottles filled with elixirs in every colour. Shops that look like new-age apothecaries. Promises of vitality and energy from cleanses that cost north of $75 a day. After years of smouldering in New York and L.A., one of North America’s it health trends has finally lit a fire in Toronto. Step onto almost any city street corner and find a juice bar already open or just opening — and a product that bills itself as completely different from the industrial, heat pasteurized liquids with chemicals and added sugar, that line grocery store shelves. Today’s juice is cold pressed, a gradual method of extraction — without pasteurization — which preserves the nutrients, vitamins and enzymes found in produce, say those who sell this juice. Often, the tonics are formulated by nutritionists, practitioners who may have some nutrition training but are not registered dietitians, mixing cutting edge ingredients — such as activated charcoal water, chaga mushrooms and spirulina — said to heal, cleanse, boost immunity, stave off illness, and cure the dreaded hangover. 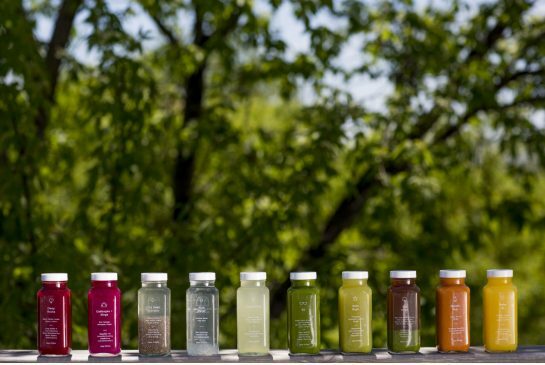 Fitbits, diet apps and society’s focus on health have set the stage for juicing’s proliferation, says Hana James, co-founder and director of retail of Greenhouse Juice, which sells its line of beautiful tonics at six locations across Toronto. In this fast-paced city, where time to plan healthy meals has become a luxury, she says, juice is a simple solution to getting nutrition on the go. “It’s a lot easier and faster than eating a whole salad,” she says. Jessica Lancaster, community manager of the Village Juicery, says juicing is all about increasing access to plant-based nutrition, which she believes can deliver powerful health benefits. Village Juicery, a young company that sells its line of juices to Holt Renfrew, among other high-end stores opened its first retail location earlier this year on College St. Lancaster says in-house nutritionists use superfoods, such as dandelion greens and kale that are picked fresh daily and cold pressed offsite each morning. “Without the fibre, the nutrients (in juice) can bypass the digestive process and go right to the blood stream and feed the cells,” she says. Nutrition experts say drinking juice may provide quick energy but, they warn, a variety of the health claims made about the benefits may be tough to prove. Nick Bellissimo, associate professor at Ryerson’s School of Nutrition, says there is limited or no scientific evidence to back up many of the claims about juicing in general and the ingredients cold-pressed to create various juices. Health Canada is taking another look at its current “guidance for consumption (quantity and frequency)” of a variety of foods including juice, spokesperson Sean Upton told the Star in an email. Upton added the guide could be updated in the future. The claim: Juice contains good sugar, not bad sugar. The claim: Juice delivers good calories, so you can drink up without worrying about the consequences to your figure. The claim: Juice, which contains no fibre, delivers the liquid nutrients in produce to cells faster and more efficiently than whole fruits and vegetables. Registered dietitian and Humber College program co-ordinator Sarah Coulson adds that stripping away the fibre from whole fruits and vegetables reduces nutrition to single nutrients when the focus should be on whole foods. The fibre, she says, is vital for digestion, feeling satiated and absorption of the vitamins, enzymes and other good stuff in produce. The claim: Juice is healthy. The truth: For those with shortfalls in their diet, juice can add nutrients and increase healthy behaviours, Coulson says. But, it’s only “one piece of a much bigger picture … not the be all and end all,” she says. The claim: Cleanses are good for you. The truth: There is no evidence to support this claim, experts say. In fact, cleanses — nothing but juice for several days — can deprive the body of amino acids and fatty acids, says Bellissimo, and that can be hazardous, depending on how long the cleanse lasts. The claim: Each small bottle of juice can contain up to three pounds of produce, providing about 95 per cent of the day’s nutrition in one easy go. The truth: As many juices don’t contain nutrition information, that’s hard to know. And too much of a good thing can be dangerous, says Bellissimo. One large carrot delivers about 240 per cent of the daily recommended dose of Vitamin A, he says. The untold quantity of vitamin A in various juices — depending on how much you drink and over how long — could lead to toxicity and symptoms, such as nausea, vomiting, headaches, hair loss and liver damage. The claim: Alkaline water, a trendy ingredient available at many juice bars, is better than tap water because it rebalances the body’s acidic PH level, staving off chronic disease. The truth: Not so, says Bellissimo. Whatever goes into our body is neutralized by the stomach’s low PH environment. The whole point of bodily acidity is to kill off foreign pathogens, he says. Even if alkaline water could affect PH levels in the body, he says, it would offer no advantage. The claim: Juice can detoxify the body.